The Employability Festival is an annual month-long series of over events held across the University and on every type of subject, with a single goal – helping you to maximise your employability prospects. The Employability Festival is organised centrally by the Careers and Employability Service, with support from each of the academic schools around the University. These events range from large fairs – the Careers Fair, one of the largest employment fairs in the country; the Teaching Fair; the Work and Study Abroad Fair; the Kent Opportunities Fair – to bespoke training designed to improve your skills – developing a CV, confidence at interviews, and tackling graduate employer assessment centres, to name just a few – to sector-specific events to highlight opportunities in teaching, banking, software design, marketing, the arts, and a huge range of others. The University’s Employability Festival runs across Weeks 5 and 6 of the Autumn term each year. Each year the School of History runs several events, and you can read the full programme online, or pick up a copy from the History Office in the weeks leading up to the Festival. 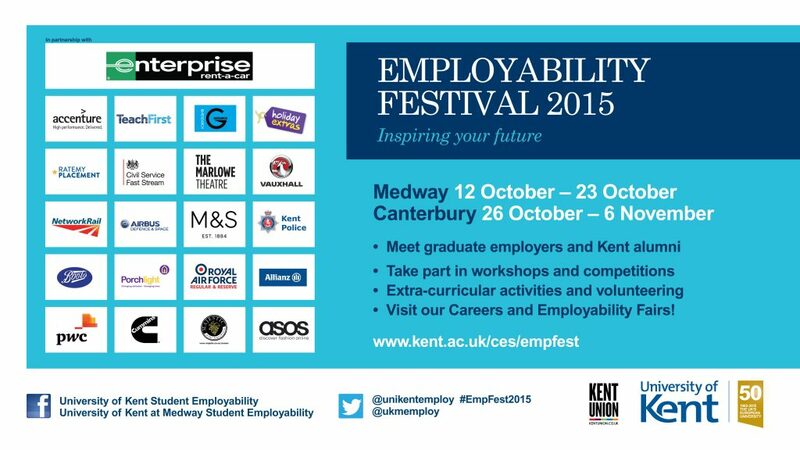 You can find out more about Employability Festival at http://www.kent.ac.uk/ces/empfest/index.html.